The Capital Barbie: Look Mom, No Sleeves! It is prime layering season because you can leave for work and it's 40 degrees but by the time you come home it's 65. It's annoying, but luckily one of this season's great trends is here for you. It's the sleeveless long vest. 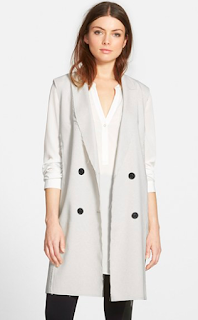 A great layering piece that works for outerwear or workwear depending on how you style it. 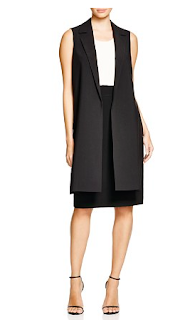 Where this as a trench, wear it as a vest with a turtleneck, heck wear it with tights as a dress! A great take from menswear. Wear this open or belt it. A double breasted style that is very corporate but a silky fabric that is very creative. Simple, city chic. I love this for work or a night out. 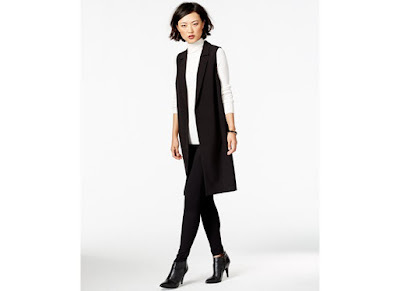 Try this trend out for fall and I promise you will be layering heavier knits under it for winter. It's an easy addition to any outfit!